The word 'Cabernet' slips so easily off most people's lips we forget that in the 1950's, most Americans didn't even know what Cabernet Sauvignon was. In the mid-century, Americans felt that Cabernet Sauvignon was too difficult to pronounce. So now that Cabernet Sauvignon and Chardonnay have become the norm it's time to get familiarized with some new wine grapes. Get your glasses ready. 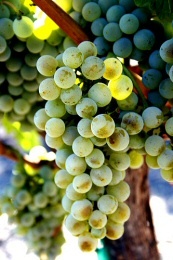 Sémillon wine is loved for its full body, like Chardonnay, but with flavors closer to Pinot Gris or Sauvignon Blanc. 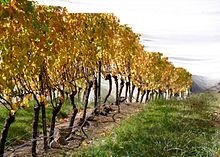 It's an important blending component in White Bordeaux and is also planted throughout Australia. In the US, Sémillon wines are usually a great price for their quality. Despite how cheap it is, Sémillon has the pedigree to be alongside the most popular white wines in the world. The primary fruit flavors in Sémillon wine are lemon, apple, pear and green papaya. There's something very waxy about the taste of Sémillon which wine writers often describe as lanolin. Depending on where Sémillon is grown it can range from being a zesty, palate-cleansing wine like Sauvignon Blanc to a rich, creamy, lemon-flavored wine like oaked Chardonnay. Sémillon is commonly blended with Sauvignon Blanc and Muscadelle in White Bordeaux. Sémillon is also the primary ingredient in Bordeaux's noble rot dessert wines which include Sauternes, Barsac, Cadillac, Loupiac, Sainte-Crox-du-Mont, Cérons and Premieres Côtes de Bordeaux.